What was so unusual about 2017? I started to become an entrepreneur. After attending several seminars about selling stuff on Amazon, I concluded it was time to take better control of my financial future. I launched a company, Whitmark Products LLC, and began a retail business using Amazon as the “storefront.” I also invested time and money to learn about an affiliate marketing program that I hope will supplement the business. This is my fourth year choosing Three Words, although I didn’t write about them last year. Each year (2015, 2016), I’ve chosen words that have several layers of meaning. This year is no different. Sell: Well, sure, you might say, now that I’ve got a business to run, sales are kind of important. No sales means no business. That’s true, but it’s just one reason this word is important this year. Another part of running of business is selling yourself and selling your vision. I’ve struggled with that throughout my career. In fact, I’m one of those people who used to cringe at the idea of “selling” anything, let alone myself. I told someone recently that I hate telling people what to do, but I recognize that’s lame. In fact, I have some good ideas and some great experience, and it probably would help some folks to listen to my advice. “Sell” is a call for confidence as well as an action to generate revenue. Invest: In a financial sense, “invest” fits right alongside “sell.” I plan to re-invest revenue in the business until it begins to generate enough so that I can also take some profit. As with “sell,” however, “invest” means more. It’s a pledge to invest more of myself into whatever I’m doing. I tend to keep something in reserve – maybe you do, too. Even though I’m closer to the end of my life than the beginning, it’s time to push the gas pedal a little harder. The more you do, the more you become capable of doing. Somehow when you spend more energy, the universe finds a way to give a return on that investment. So, I’m going to invest more energy. 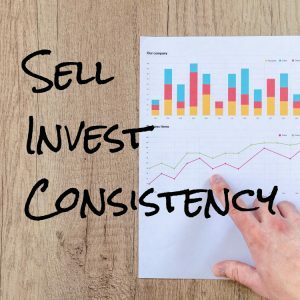 Consistency: For me, this is about devoting daily time to things that are important, especially growing the business. It won’t grow if I’m not working on it every day beyond the time I spend on my “day job,” reading, watching TV, exercising and sleeping. (I’m a pretty consistent sleeper, and I consistently brush my teeth every day. There’s hope.) There’s a little more to this one, too. It’s about not giving up, even when I miss a day or don’t devote quite as much time as I think I should. It’s about fighting back discouragement, washing off a bad day and starting another winning streak. And it’s about reminding myself that when there is regular, consistent effort, it will pay off. If I consistently sell and consistently invest more of myself, I’ll be able to build on the things I started in 2017. What are your Three Words? Share them in the comments, or share them on social media with the hashtag #My3Words. Or, if you’d simply like to read about others’ Three Words, search for hashtag on your favorite social channel. Have a great 2018!